Torpedo is a non-profit (project-based) organization devoted to the promotion and production of artists books, art theory and critical readers in contemporary art. Situated in Trelastgata, Oslo, Torpedo is both a publisher and a bookstore, and occasionally a venue for exhibitions and concerts related to book launches and the process of publishing, or discursive activities like panel discussions and debates. Founded in 2005. Elin Maria Olaussen, artist and co-founder of Torpedo, educated at KHIB, Fine Arts Academy, Bergen. Lives and work in Oslo. Karen Christine Tandberg, art historian and co-founder of Torpedo, Master degree in Art History UIO, University in Oslo. Lives and work in Oslo. Publication Studio was founded 2009 by Matthew Stadler and Patricia No. Based in Portland, Oregon, the studio also visits other cities to collaborate with like-minded fellow travelers and found sibling studios using the same equipment and approach. Currently there are six Publication Studios. Publication Studio print and bind books on demand, creating original work with artists and writers. They use any means possible to help writers and artists reach a public: physical books; a digital commons (where anyone can read and annotate the books for free); eBooks; and unique social events with. 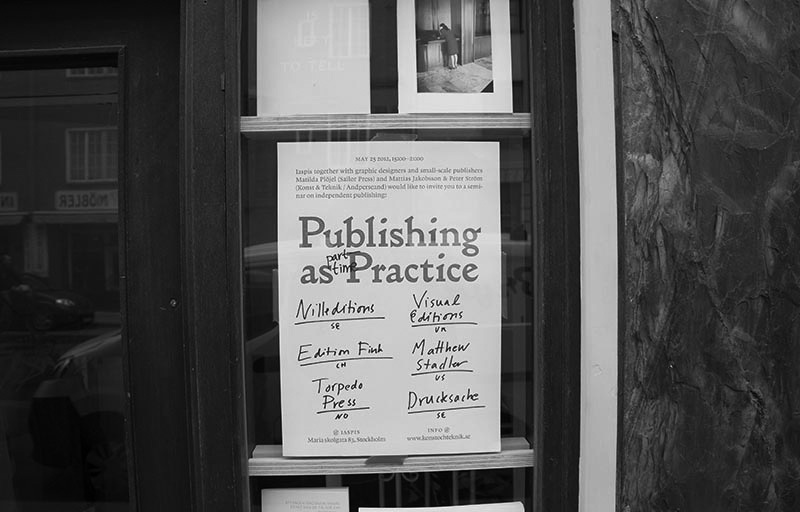 Publication Studio is a laboratory for publication in its fullest sense not just the production of books, but the production of a public. Matthew Stadler is a writer and formerly the literary editor of Nest Magazine and co-founder of Clear Cut Press. He has written four novels and received several awards and fellowships in recognition of his work. More recently, he has compiled four anthologies about literature, city life and public life. His essays have been published in magazines and museum catalogs around the world, and focus on architecture, urban planning and the problem of sprawl. Nilleditions is a book publishing project founded by graphic designer Nille Svensson in 2011. Nilleditions ambition is to explore publishing as a means of self expression by trying to avoid conventional limitations on how book projects are initiated, produced, spread and consumed, and to embrace the possibilities and restraints associated with publishing in the post press era. Nilleditions publishes each title in two editions one unlimited edition, where every book is printed in one copy every time it is ordered and one limited edition, more to be seen as an artists book. Nille Svensson is a Stockholm based graphic designer who co-founded the design agency Sweden Graphics and the publishing house Pocky. Apart from running Nilleditions he also runs Studio Nille Svensson and works as art director at Tidningen Konstnren and developer at Publit. His work have been widely published and awarded. edition fink is an independent publishing house for contemporary art, founded in 1994 and based in Zurich, which concentrates on producing artists’ books and art catalogues. What distinguishes edition fink is its close collaborations with the artists on the design and production of the publications. Recently about 8 publications a year result from these collaborations, each in its own unique shape and design. Georg Rutishauser is a trained artist and worked for several years under the label Rutishauser/Kuhn as an artist group in the field of art. Beyond this he started to design books. After that he practiced both professions for some years: designing books, and later also publishing them, as well as producing art works, installing exhibitions and making performances. Also he was always involved with collaborative curatorial projects. While Kuhn and Rutishauser finished their collaboration in 2001, Rutishauser decided to focus on book projects and publish them through edition fink. Druchsache is a publishing house in Stockholm founded in 2010 that mainly focuses on poetry and critique, published as printed material as well as immaterial appendixes such as performances, readings, lectures, film, opera, pdfs etc. Publishers are Jacob Grönbech Jensen, Rikard Heberling and Emi-Simone Zawall. Jacob and Rikard work as graphic designers and Emi-Simone as freelancing editor and translator. B-B-B-Books was founded in Stockholm in August 2011, and takes an interest in the interaction between the different parts of book production. Every new project aims to encourage the convergation of photography, text and production. B-B-B-Books is run by the photographers Klara Källström and Thobias Fäldt and the graphic designers Axel von Friesen, Petter Törnqvist and Marika Vaccino Andersson. Andperseand is a micro-publisher founded in 2009 by graphic designers Konst & Teknik (Mattias Jakobsson & Peter Ström), theorist Jeff Kinkle and artistEmanuel Almborg, based in Stockholm and New York. With the aim of exploring the book in both its physical and digital form, Andperseand functions as a platform for the groups collective and individual publishing projects. To this date three books have been published, each release accompanied by lectures and/or exhibitions. Sailor Press is founded and run by graphic designer Matilda Plöjel and aims to offer an alternative to publishing restricted by the constraints of institutions or larger publishers. In close dialogue and collaboration with the artists we develop publications that explore the artist’s work as well as the book as a medium. Sailor Press also distributes critical writings on design, craft and art.